You'll be £14.99 closer to your next £10.00 credit when you purchase Sheffield in The Great War. What's this? The book thus offers to the general reader an easy-to-read narrative with many pictures, and it provides a valuable source of information and reference to those who would like to learn more. Sheffield in the Great War starts with a brief account of the conflict itself, looking at its enormous cost not only in terms of money but also in thousands and thousands of men and horses killed or disabled. Next it presents short reviews of Britain and the city in 1914 to introduce national features which became important in wartime Sheffield. The following chapters describe Sheffield life in the four and a half years of war, with special attention to recruiting and the creation of more than twenty new military hospitals. Huge numbers of people devoted themselves to voluntary work, and the book includes much information that has been lost for the past hundred years. 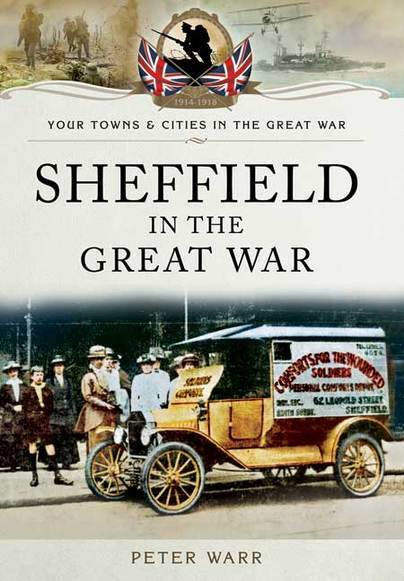 Part of the excellent 'Your Towns & Cities in the Great War' series, this volume covers the city of Sheffield, 'Armourer to the Empire', and the challenges it faced with the huge and ever growing demand for weapons, equipment and men (50,000). As the men went off to war the women stepped up and took over their jobs, working long hours in difficult and demanding conditions. The books tells too of more than thirty new hospitals, of the shell-shocked and wounded, a Zeppelin raid, riots and the harsh treatment of German residents. Peter Warr is an Emeritus Professor at the University of Sheffield. He has written widely about the citys history, as well as publishing more than twenty books and many articles in his profession as an applied psychologist. He is the holder of several national and international awards, and serves locally as honorary custodian of the Ranmoor historical archive. His royalties for this book are being sent by the publishers directly to the Royal British Legion and they will be put to use in the Sheffield region.